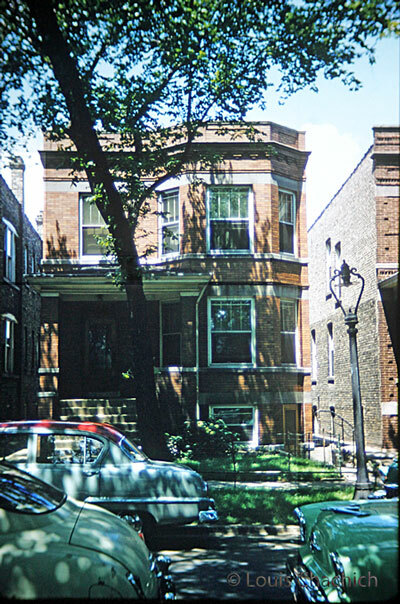 Here is a picture of the brownstone rental that my parents lived in for a couple of years in 1953-54. It was located at 5014 W. Pensacola Ave in Chicago, Illinois. Out front is “Luanne” the 1953 Plymouth Deluxe that my parents purchased new after marrying in 1952. They paid $46 extra for the red roof which, my mother tells me, was great for finding the car in parking lots. Here’s a shot of that same house in modern times (found at trulia.com). 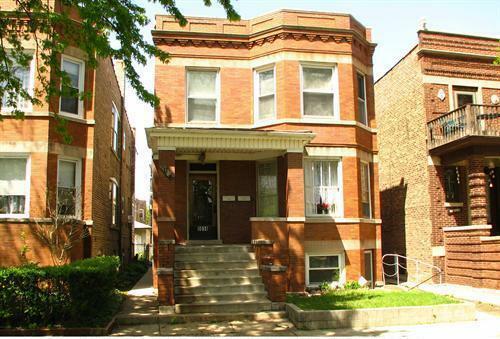 According to Trulia this multi-family home was built in 1913, has two bathrooms and is 2478 square feet. I sure hope they upgraded a few things since my parents lived there! This is probably a two-family home today but back in the 1950s, it contained 5 rentals — can you believe it?! and it wasn’t long before he put back the 7 watt. General Finance was all the way downtown so I had taken the el, however, Irving Park Blvd was closer to where we lived. I was really happy for that job [at Victor Adding Machine Co.]. A huge room with many persons, each department was a row of desks. I was lucky to be the secretary to the auditors..an all male department. When they were out of town I would help the typing pool with their work. One of my jobs was delivering the pay checks to everyone in the building (including where the machines were being made). I remember Mr. Pomiaks department was really noisy. It was pleasant because everyone was so happy to see the paychecks arriving. One thing they did, that I am sure would not be allowed today, was to allow the wives of alcoholics pick up the checks from the Personnel Department. There was a two story Sears and Roebuck off of our main drag and Irving Park Blvd; the groceries being on the lower level so I was able to walk to the store with one of those little two-wheeled shopping carts. We were also near Montrose harbor which had a long dock leading toward the water which might have been off of Lake Michigan. Oddly, enough we happened to go there within a few days of a serious situation. The tides had risen to over eight feet, swept the fishermen off the dock, who drowned.